It’s time for the brioche-rich, cinnamon-swirled, colorfully sprinkled cake that is KING CAKE! It’s carnival time here in New Orleans. That means that we’re celebrating life, pushing the limits of indulgence, dancing in the streets (most literally), catching as many beads as we can, throwing as many beads as we can, and eating King Cake… all before Lent next Wednesday. We have a lot to fit into this next week! In New Orleans, which is a world in its own, we eat King Cake between very specific dates: January 6th to honor the Three Kings and Fat Tuesday (the madness just before Lent). What’s with all of the colorful cake madness? History. We need a history lesson. I hesitated to make this cake at home this Mardi Gras. 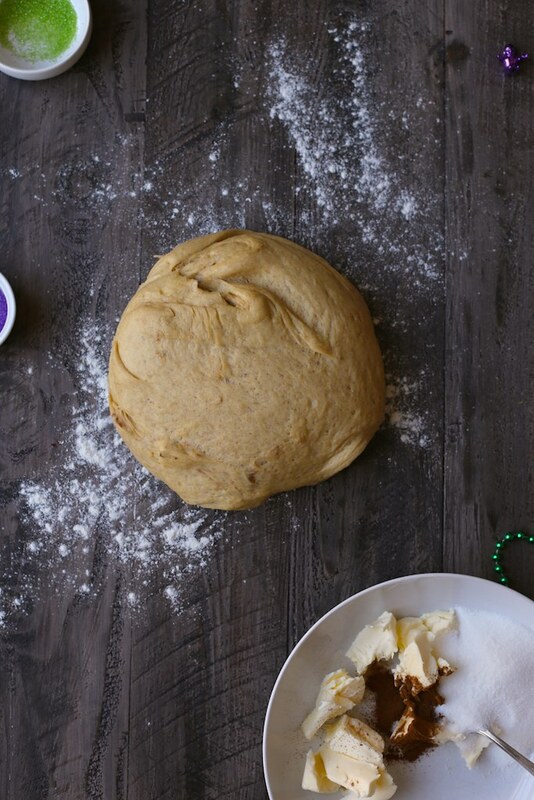 King Cakes are absolutely everywhere in New Orleans and really… there’s no need to make one at home. That would be like visiting Paris and staying indoors to make your own croissants. I’m also very new to New Orleans. Who am I to make a dang King Cake? Well… here goes nothing (/everything). • Is that a plastic baby Jesus in my cake? Kinda yea. • 10 things to know about Mardi Gras. Yes… Mardi Gras is only a legal holiday in Louisiana. It’s a different world. • Mardi Gras Mix Tape Zing! Here’s what we need: flour and salt, milk, sugar and yeast. The makings of a fine and good yeasted bread. What takes this treat from bread to cake is fat and flavor. Lots of melted butter, five creamy egg yolks, ground cinnamon, and lemon zest! We’re also going to need a mega amount of sprinkles. Purple for justice, green for faith, gold for power. And a little plastic baby to sneak into the cake after baking. Whomever gets the cake has to buy the next King Cake… and the circle never ever ends. If you’re not with us here in New Orleans for Mardi Gras, I hope you make this cake and fill your kitchen with the spirit of this city. It’s special. It’s delicious! It’s Mardi Gras! Sugar, yeast, and a spoonful of flour are added to warmed milk. This is how we activate the yeast. It’s like the starting line for the yeast race. Stir and let the yeast eat all the sugar and flour. 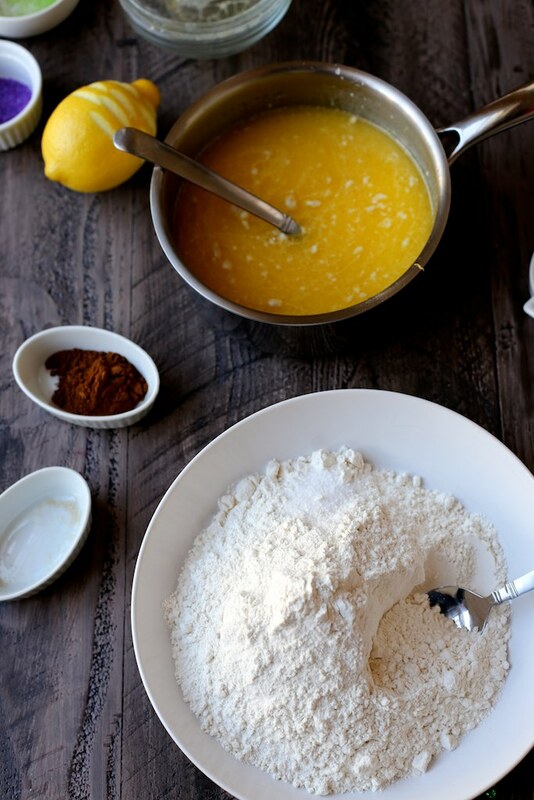 Once the yeast mixtures comes alive to foam and froth, melted butter, egg yolks, and lemon are whisked in. This cake dough is rather soft and wet. I brought the wet and dry ingredients together with a spatula before kneading it with a dough hook for 7 minutes. 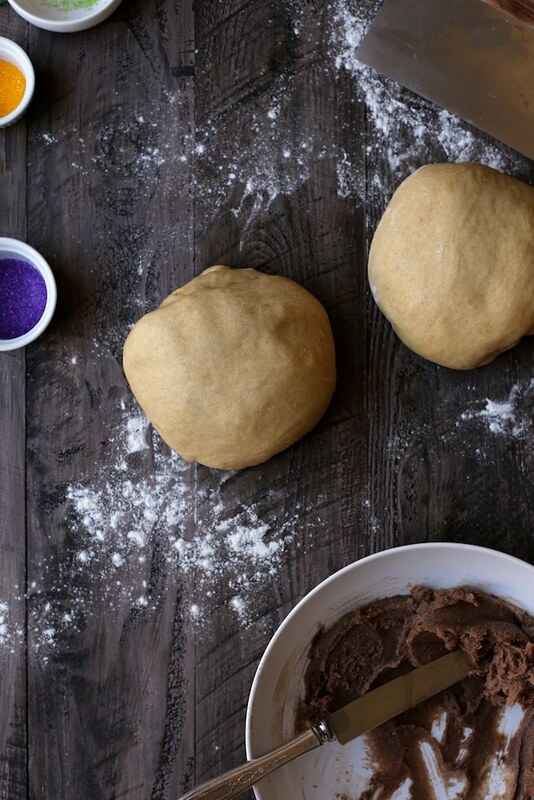 Leave the dough in the mixing bowl to rise. No need to dirty another. Cover with plastic wrap and allow to rest in a warm, draft-free place for an hour and a half. This is also where the filling comes together. 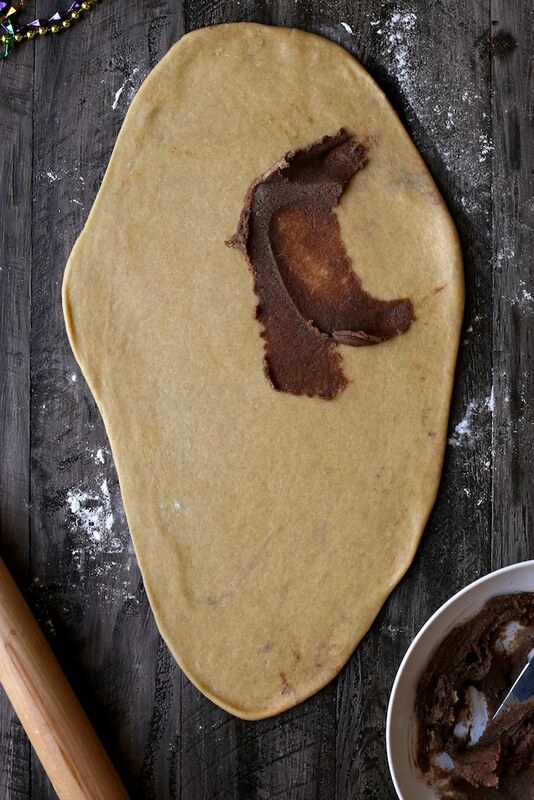 Softened butter, sugar, cinnamon, and cocoa powder. We’re going to mix this into a spreadable paste for the inside of our cake. Dough is divided in two. Rolled to about 20-inches long… the width the flexible. Spread with buttery spice! And roll the remaining half of dough! Same same. The two rolls of dough are lined up and twisted together. Coaxed into a circle and placed on a lined baking sheet. Egg wash to make everything golden as ever. I let the cake rest for about 30 minutes while the oven preheats. This allows the cake the stretch out and relax before it gets to work in the oven. Baked up big and golden brown. Once cooled the cake is frosted with a lemon vanilla glaze. Call your friends. Call every single one of them. 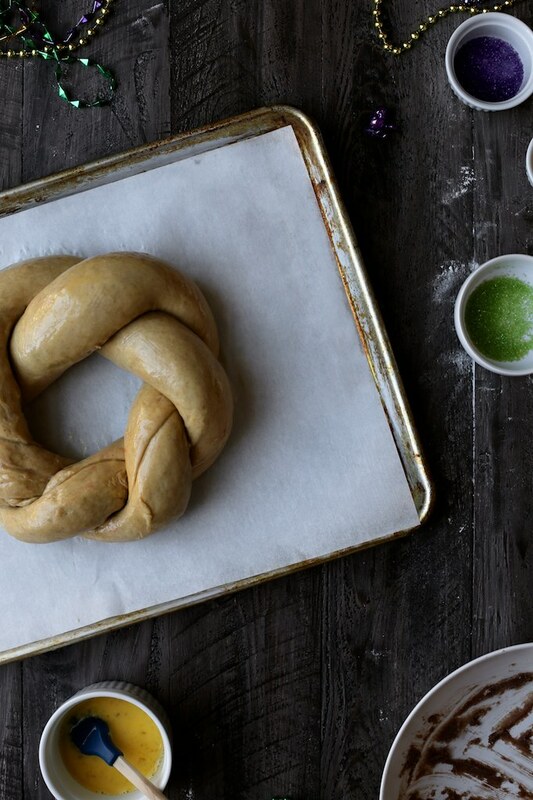 You made a King Cake and that’s just about the best thing in the world. Soft and rich, cinnamon swirled and sweet glazed! It’s like a fancy brioche coffee cake, with a tiny plastic baby inside, and regal festive sprinkles on top. Don’t forget to to lift a corner of the cake and tuck the baby up inside! Happy Mardi Gras! Le Bon Temps Roule! Buttery soft cinnamon swirl King Cake with lemon glaze and all the sprinkles. To make the cake, heat milk in a small saucepan. 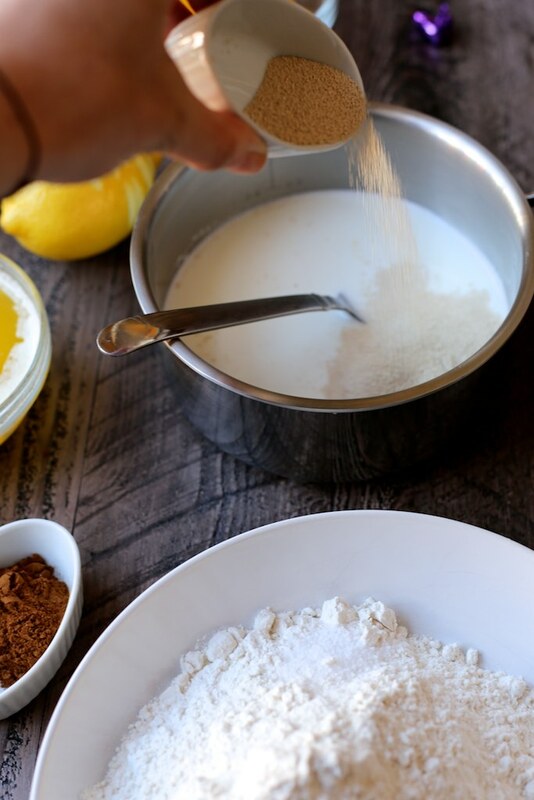 Remove from heat and whisk in the granulated sugar, yeast, and a heaping tablespoon of the flour, mixing until both the sugar and the yeast have dissolved. Let sit for 5 minutes all allow the yeast to foam. 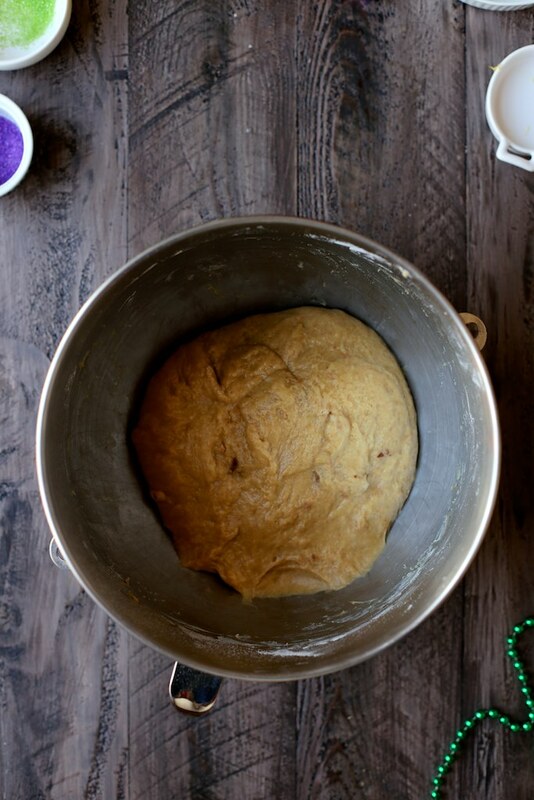 Cover the bowl with plastic wrap, and set aside in a draft-free place to let it proof, or rise, for 1 1/2 hours or until the dough has doubled in volume. While the dough rises, combine the filling by mixing all ingredients into a smooth paste. Once the dough has risen, punch it down and divide the dough into 2 equal pieces. 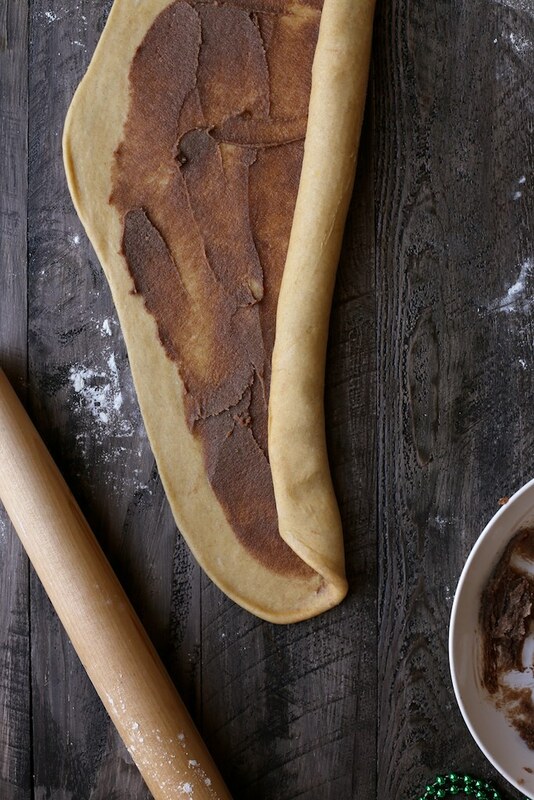 One at a time, roll each piece of dough to about 18-20 inches long. The width will be about 6 to 8 inches. Spread with half of the buttery filling mixture and roll (cinnamon roll style) starting from the long end of the dough. Repeat with the second piece of dough. You’ll have two rolled ropes of dough. Press and roll each dough out another 2-inches or so to even the thickness of the strands. Line the ropes of dough up and twist together starting from the center. Bring the edges around and seal into a circle. Place a rack in the center of the oven and preheat oven to 375 degrees F. Line a baking sheet with parchment paper and place the circular cake on the baking sheet. Cover loosely with plastic wrap and allow to rest for 30 minutes while the oven preheats. Brush cake lightly wish egg wash. Place in the oven for 30 minutes to bake until bubbling and golden brown. Remove from the oven and allow to cool completely before glazing. 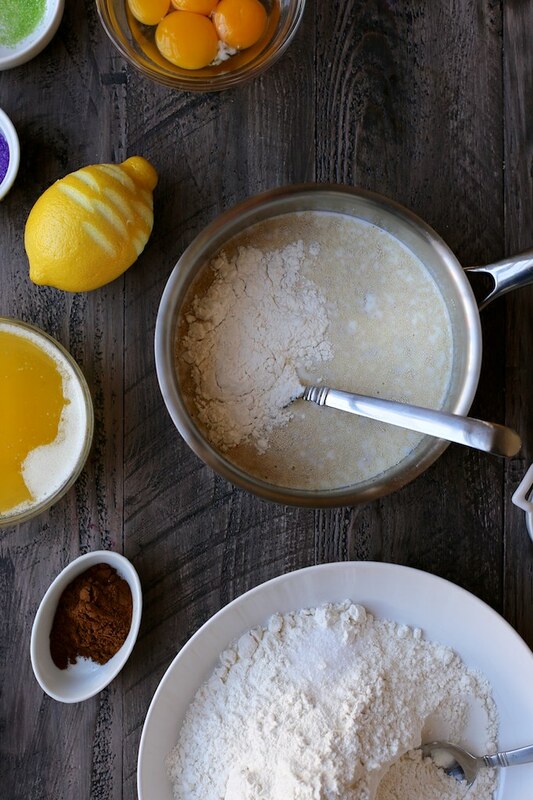 In a medium bowl whisk together powdered sugar, milk, lemon, and vanilla extract. The glaze should be thick but still pourable. Spread glaze over the cooled cake. 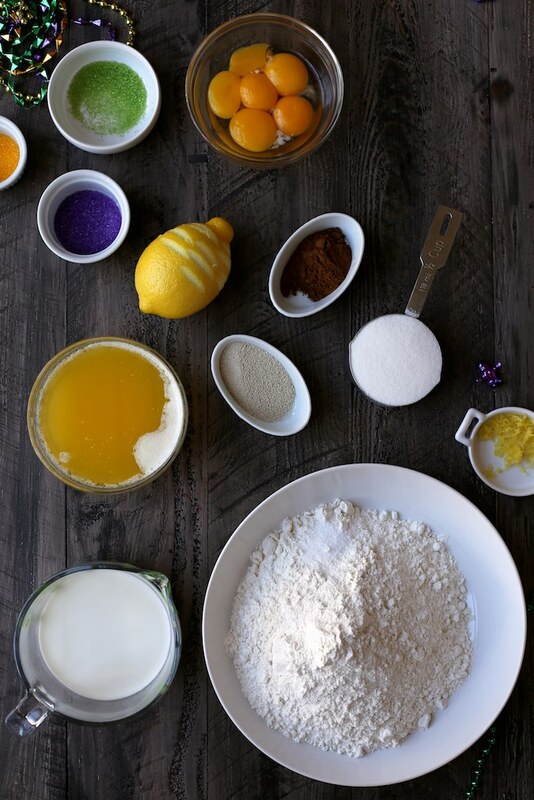 Sprinkle with purple yellow and green sprinkles. Lift a corner of the cake and tuck the baby up inside for someone to find! Serve in big wedges with hot coffee. Happy Mardi Gras! This is a delicious king cake! I’ve made it a feeble times now, and it always leaks a bit of cinnamon sugar out onto the baking sheet, which bakes into such delightful candy that I can’t decide if this is a flaw in my sealing or the greatest of boons! Thank you, thank you! Being 2000 miles from New Orleans, I’ve been looking unsuccessfully for a good King Cake recipe. I’ll be baking this over the weekend. If it’s half as good as your browned butter chocolate chip cookies, I’ll be thrilled. I am so pumped for this recipe! As a former resident of Louisiana turned New Yorker, I was looking for a way to celebrate Mardi Gras, and this is it! I love your King Cake! I remember my first King Cake in New Orleans and it was glorious! Your cake is beautiful! I think I saw this last night on Pinterest! 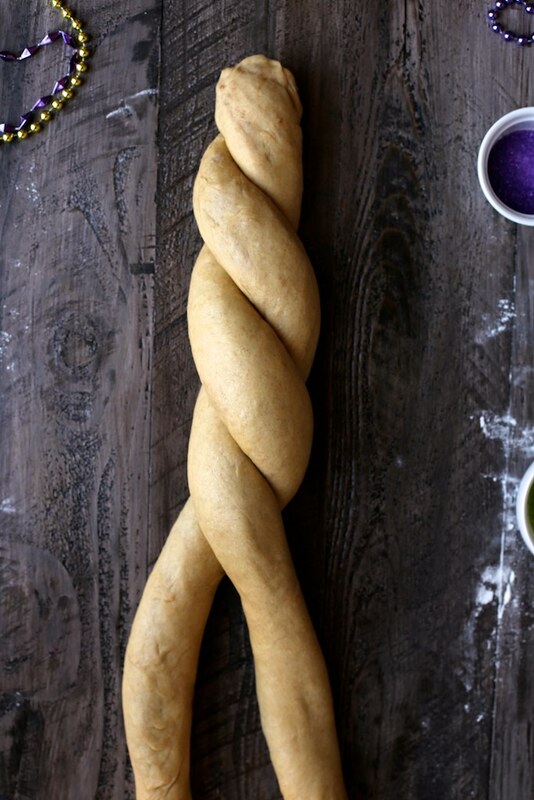 I’ve never made a Mardi Gras King Cake but I’m going to now!! What a beautiful presentation Joy !! Love this cake and love your links too! Good luck fitting in all that awesomeness before Lent! You can do it! I want to dance in the street, with a big slice of king cake in one hand and a tambourine in the other—forgive my lack of rhythm in advance! I miss real King Cakes – having lived in New Orleans for many years there is nothing like a fresh King Cake. The office I worked in had a tradition (like most offices in NOLA) that every Friday someone would bring in a King Cake and whoever got the baby had to bring in the next one. It was a great way to taste all the different ones from all over the city. Filled, iced, plain, traditional, every part of the city had its own way of doing a King Cake. It was also a great way to gain 20 pounds during Mardi Gras season! Oh, I know what it means to miss New Orleans . . . . Thanks for the memories, Joy. I can’t even lie. I have NEVER had King Cake! But anything that involves Brioche and ALL the color sounds like something I am MEGA on board for. LUHVING this cake! Pinned! When do we add the baby? Dang girl! Your cake looks perfect. I’ve always wanted to make my own king cake! That looks a lot more fun than here. In the UK we just make pancakes on Shrove Tuesday. And not your big thick American pancakes either. It’s quite boring. 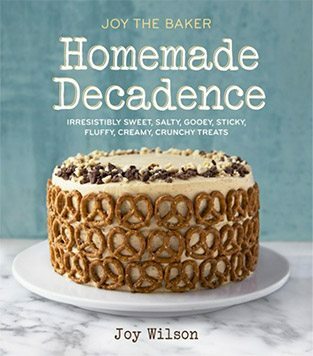 I wish I was in your kitchen right now Joy. I am all for sprinkling more rainbows on bread any day.